Pakistanis will go to the polls Saturday in parliamentary elections that mark the first democratic transition from one elected civilian government to another in their country’s 66-year history. But support for democracy is thin in Pakistan, according to a Pew Research Center survey of Muslims around the world. By a nearly two-to-one margin (56% to 29%), Pakistani Muslims say they would prefer “a leader with a strong hand” over “a democratic form of government” to solve their country’s problems. This is among the lowest levels of support for democracy in the 37 countries and territories where the question was asked, as the chart on the right shows and a new Pew Research infographic illustrates. In addition, most of Pakistan’s Muslims doubt that they can have any real political influence. Two-thirds of Pakistani Muslims either completely agree (53%) or mostly agree (13%) with the statement that “people like me don’t have any say about what the government does.” Just 25% disagree, either completely (20%) or mostly (5%). The Pew Research survey of Pakistani Muslims (who make up 96% of the country’s population, according to a December 2012 Pew Research demographic study) was conducted in November 2011, well before the current election campaign. A more recent Pew Research poll, conducted in March of this year, shows that most Pakistanis think the country is headed in the wrong direction, and 83% give an unfavorable rating to the incumbent President Asif Ali Zardari of the Pakistan People’s Party. More than a half dozen political parties are vying for seats in parliament, including some opposition parties that formally identify as religious or Islamic. In the survey of Muslims around the world, respondents were asked to compare Islamic political parties with other parties. A plurality of Pakistan’s Muslims say Islamic parties are about the same as other parties (39%). 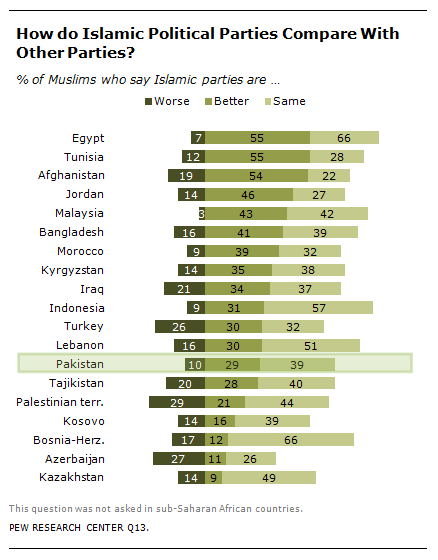 Just 10% say Islamic parties are worse, while 29% see Islamic parties as better than other parties. More broadly, many of Pakistan’s Muslims think that religious leaders should have a role in politics. About half say that religious leaders should have either “some influence” (27%) or a “large influence” (27%) in political matters, while about a quarter say religious leaders should have “not too much influence” (12%) or “no influence at all” (14%).